I wanted to show my Shoalwater Shawl off even though it has not yet been blocked. 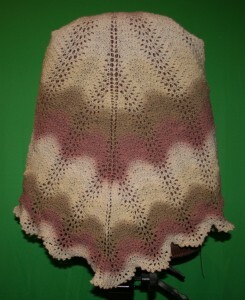 The pattern is by Evelyn A Clark and it is Fiber Trends S-2011. The pattern is great because you can use anything from a fine lace weight yarn up to a worcested weight yarn. 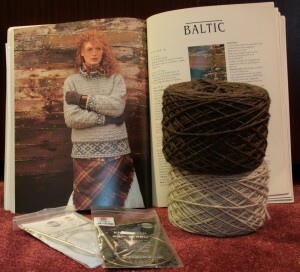 The yarn requirements and suggested needle sizes are all on the pattern too. 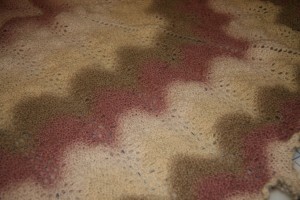 I knit the shawl on Addi Turbo needles and started with size US 7 but decided to use US8 after doing a little swatch. I was given some yarn called Kauni by a dear friend and had to immediately make something from this gorgeous gift. The shoalwater shawl had been on my list of have to knits for quite a while so once I had the yarn there was no question as to what it was going to be used for. The pattern called for a knitted on i-cord edge but I knew I was going to run out of yarn. 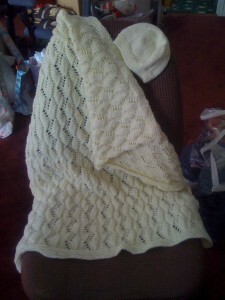 I completed the picot edge and then just finished the shawl at that point. I will get it blocked as soon as I have set up my blocking board again. This will not be the only Shoalwater Shawl I make and already have one on the needles in a very fine lace weight yarn. 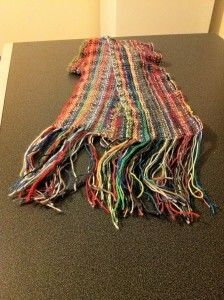 I was also given four or five more skeins of the Kauni so there will be more shawls in the future. 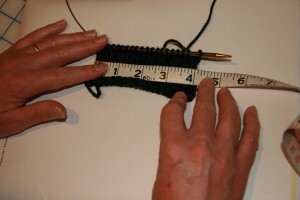 The swatch was done on #7 addi turbo needles and is exactly 20 stitches to 4 inches with Cascade 220 yarn. This is the first time I have used Cascade 220 yarn for anything other than a felted project. So I really needed to do a swatch for this vest as I am not familiar with how the yarn should feel knitted to the correct guage recommended on the yarn label. I will use #5 addi turbo needles for ribbing, armholes and neck band and #7 for the body of the vest.